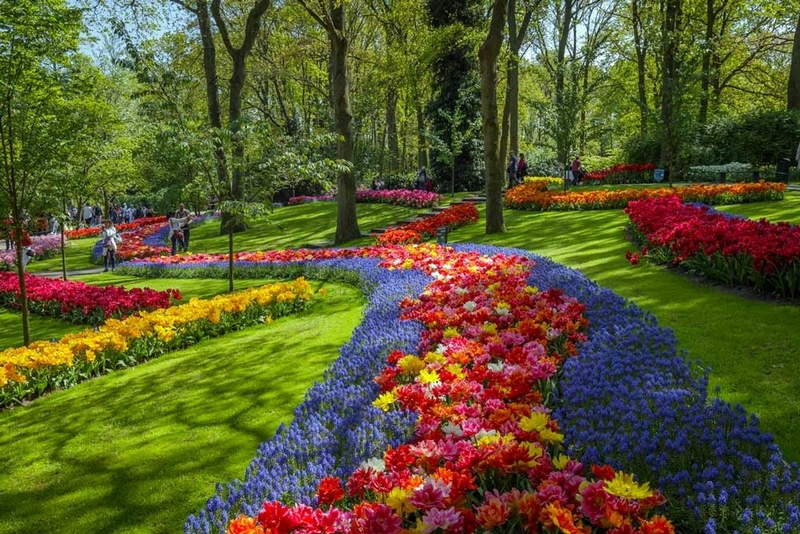 Keukenhof Gardens are located near Lisse, a small town in the Dutch province of South Holland in the Netherlands. It is just south of Haarlem and Amsterdam in the Dutch countryside. Keukenhof is open for a few short weeks during the spring time and exact dates change every year. In 2018, the gardens will be open from March 22 through May 13. Over 7 million bulbs will bloom this spring, with a total of 800 varieties of tulips over a spacious 79 acres. To ensure the 8-week long blooming season in Keukenhof they plant the bulbs using the “lasagna technique”. 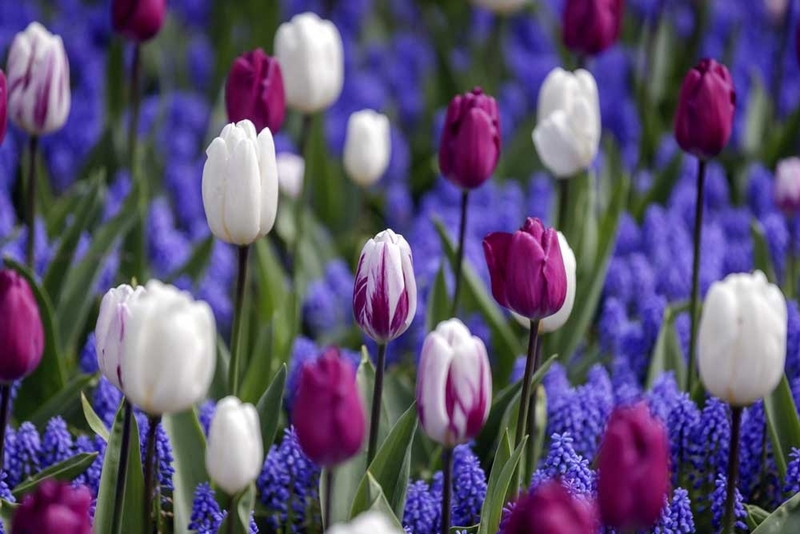 Flowers are planted in three layers: the late-blooming flowers in the bottom layer, the April-flowering bulbs in the middle layer and the early-blooming varieties in the top one. Planting bulbs in this manner gives the fields of flowers a unique, unforgettable experience! Related: Pictures Don’t Do Keukenhof Justice. 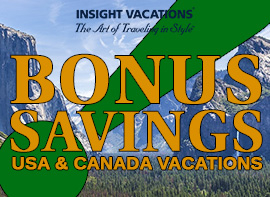 Click Here To See In The Gardens In Person! The park also has more than just flowers; there are over 2,500 trees of 87 varieties in the park and more than 100 statues. What’s the best way to view the flowers? 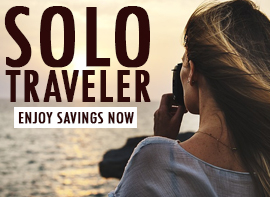 Visitors can always grab a free map and walk around solo, but many travelers prefer to go with a professional guide who takes you along the highlights of the park for about an hour. You will hear about the history of the park, the theme for the year, and the different planting techniques. Another option is to relax as you enjoy the peace and quiet of the endless bulb fields around Keukenhof in an electrically-propelled whisper boat. These boats travel through the beautiful Dutch flower bulb landscape in virtual silence. The boat trip takes 45 minutes and is a fun way for people of all ages to experience the beauty. Looking for something a little more active? Explore the colorful surroundings by bicycle! Keukenhof rents bikes for adults and children, as well as tandem bikes so people of all ages can explore the grounds outside of the garden. For a truly unique experience, you can take a breathtaking scenic flight in the Royal DC-3 Dakota aircraft. These flights take place on Saturdays and Sundays from March 31 – May 6, 2018 and give you a breathtaking view of the colorful flower fields and Keukenhof. Blooming at Keukenhof parallels that in nature. The crocuses, daffodils, hyacinths and early tulips flower at the start of spring. Other flowers bloom later in the season such as the larger tulips. Keukenhof updates their Facebook page every Wednesday with a flowering report so you can stay abreast of the latest blooms. Weekends and holidays are especially busy times for the gardens, the busiest day being the bloemencorso (flower parade). This year, the flower parade falls on Saturday, April 21, 2018. Early mornings, Monday- Wednesday, as soon as the park opens, is the best time to walk around and view the fields of flowers. 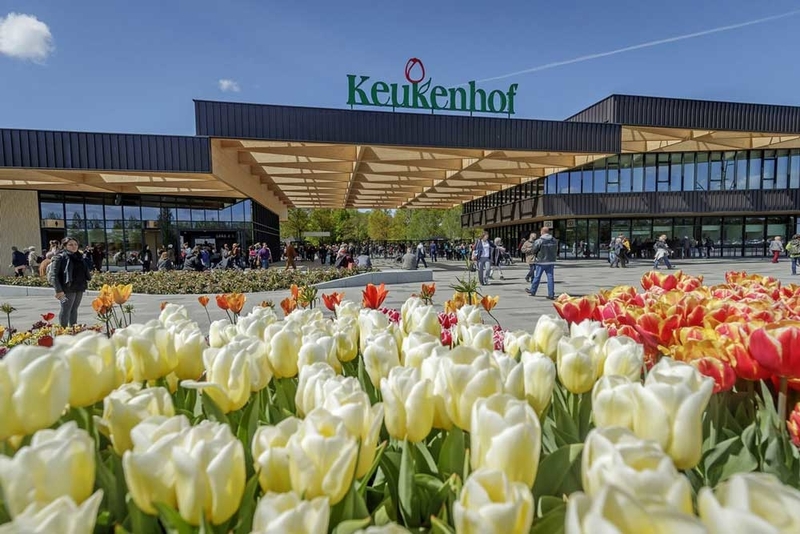 Is Keukenhof fun for kids? 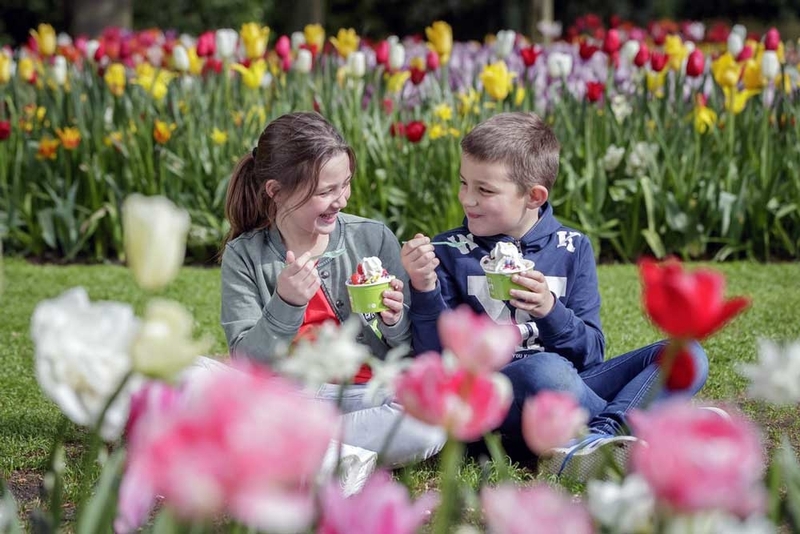 With tons of activities just for kids, Keukenhof is also fun for the little ones. They will have a blast with the treasure hunt, petting farm, maze and the playground. 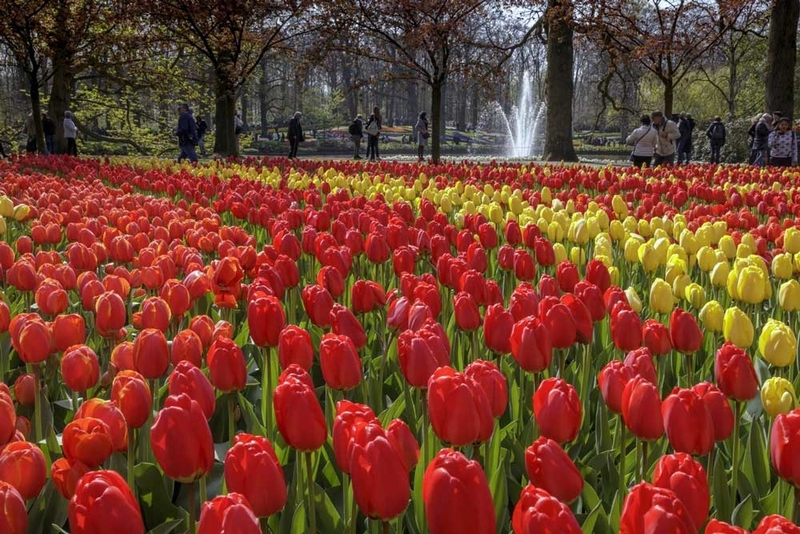 Keukenhof is great day outing for the whole family. Related: Experience The Beauty In Person. 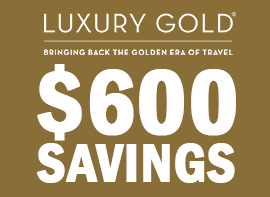 View Discounted Rates Now! When did the garden first open? The park opened its gates to the public in 1950 and was an instant success, with 236,000 visitors in the first year alone. Now it attacks more than a million visits a year, 75% of them are from more than 100 different countries! I’ve seen Keukenhof already. Is it worth going again? Yes! With more than 9 miles of footpaths and 79 acres of flowers, it’s unlikely you will see everything the park has to offer in one visit. Keukenhof also has had a different theme every year, so there will be new sites, art and activities. The 2018 theme is Romance in Flowers. The park with its sea of flowers is sure to put you in a romantic, spring mood. 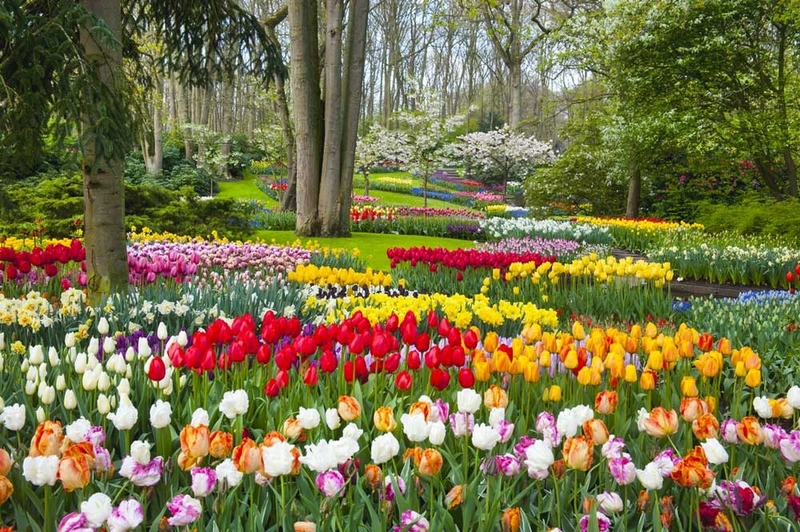 Visit the spectacular Keukenhof Tulip Garden and enjoy the peace and tranquility in this beautiful, world-famous park!